David Prowse, who donned the Darth Vader costume in the Original Trilogy and the Star Wars Holiday Special, was born on this day in 1935. The 82-year-old is a former bodybuilder and weightlifter who became an actor and selected to play the part of one of the most iconic villains in the history of cinema. The English actor spoke lines from within the suit during filming in his Bristol accent, but this ended up clashing with George Lucas' idea about Darth Vader. James Earl Jones was dubbed over as the voice of the Dark Lord of the Sith - a fact unknown to Prowse at the time of filming. 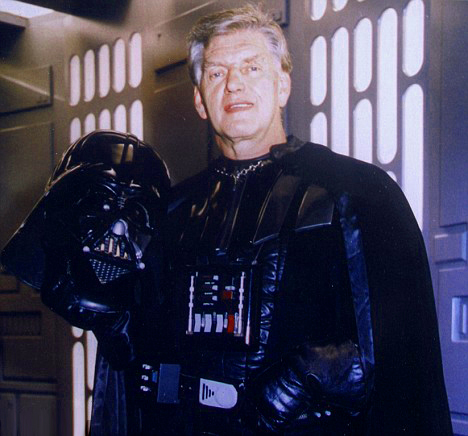 The video below features clips of David Prowse's voice of David as Darth Vader. Prowse is critical of the fact that he never got any publicity as Darth Vader and said he chose to play Vader because he felt the villain was usually the most memorable. This remarks can be corroborated by the fact he did not appear as a guest for the 40 Years of Star Wars panel at Star Wars Celebration Orlando 2017 (although it is unclear whether this was because he did not get invited or chose not to go).